India dishwasher market is exhibiting a steady growth within the country. Currently, the market is categorized as a niche segment, however, with growing product awareness amongst consumers, the market is anticipated to gain acceleration over the coming years. Increasing disposable income, growing number of working couples as well as changing consumer lifestyle are driving the growth of dishwasher market in the country. Consumers are now readily spending on products which provide convenience and time saving. Moreover, dishwashers are one of the primarily used kitchen appliances in the European and American markets, however, the product is still at nurture stage within the residential segment in India. Furthermore, the Southern region contributed majority of the revenue share in the overall India dishwasher market share in 2017, as the region correspond to early adopters and holds huge working-class population which have readily adopted the new technologies and products. The India dishwasher market report thoroughly covers India dishwasher market by type, applications, distribution channels, and regions. 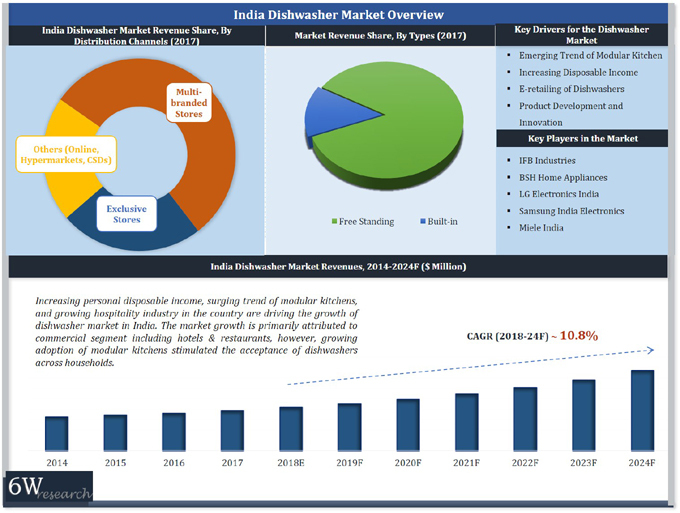 The India dishwasher market outlook report provides an unbiased and detailed analysis of the India dishwasher market trends, opportunities, high growth areas and market drivers which would help the stakeholders to decide and align their market strategies according to the current and future market dynamics. 12.1	BSH Home Appliances Pvt. Ltd.
12.3	Samsung India Electronics Pvt. Ltd.
12.4	LG Electronics India Pvt. Ltd.
12.5	Miele India Pvt. Ltd.
12.6	Franke Faber India Ltd.
12.7	Whirlpool of India Ltd.
12.8	Elica PB India Pvt. Ltd.